When it comes to selecting a porta potty cleaning service for your project, you want to feel confident that your site is in good hands. Having clean portable restrooms at your jobsite is important to promote a positive work environment and for the overall health of your team. United Site Services porta potty cleaning service provides peace of mind knowing you will have clean portable restrooms with our unique 8 Point Service Plan, designed for quality assurance. 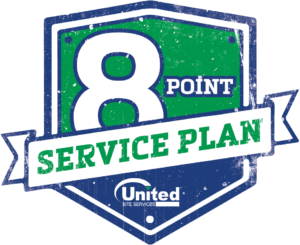 The 8 Point Service Plan ensures clean portable restrooms are available to all customers by documenting the porta potty cleaning service process, equipping our service technicians with the best porta potty cleaning solutions and holding our entire team accountable for ensuring this process is consistently replicated. Many variables can factor in to the recommended porta potty cleaning service schedule, however, the most common service frequency is once per week. Your site will have clean portable restrooms and avoid overuse if you follow the general rule of thumb which is 1 Porta Potty for every 10 people on site over a normal 40 hour work week. If your project has more people or is operating for longer hours, you should consider increasing your porta potty cleaning service schedule to additional visits each week or you can also add additional porta potty rentals to accommodate the increased usage. Consider adding a separate porta potty for men and women on site. We offer a modern and extensive fleet of portable sanitation, temporary fencing and many other solutions to meet all of your site needs. Our portable toilet service rentals undergo a rigorous pre-delivery cleaning and inspection process before your rental is delivered. Our porta potty cleaning service are constantly evaluated to ensure their condition is satisfactory. Each year USS adds thousands of new portable toilet rentals to its inventory to provide the best customer experience possible. We understand the demands associated with a wide range of customer needs including proper planning, reliable service, timely delivery, rapid response, clean like-new restrooms and much more. We have the ability to deploy equipment quickly and the inventory to support a large portable toilet project when you need us more. Our professional service technicians are dedicated to providing you with clean portable restrooms at all of your sites. Backed by training, the best porta potty cleaning solutions and equipment, our team is able to provide you with an unmatched porta potty cleaning service. Our entire team, from the service technicians performing the services on site to our professional customer care team assisting with setting up the best portable toilet service plan for your jobsite, will be there to for you throughout all phases of your project. Let us help with your upcoming portable toilet service needs by calling 1-800-TOILETS.